From budget friendly to Premium coverage, Sandhill Studios has a wedding package to meet your needs. If you think you can’t afford a wedding videographer, we hope you’ll take the time to view our sample videos and look at the packages that we offer. We’re very flexible so don’t hesitate to call, we’d love the opportunity to discuss how we can work with you to create a package that will fit your budget, no matter how big or small. Don’t be afraid to call or email if you have any questions. We look forward to telling your story! I hired a photographer so why hire a videographer? A: Can we afford both a Videographer and Photographer? B: Of the two, what would be more important to us years from now, photos or a video? C: Can we find a Videographer who will do our wedding justice? These are just a few questions that me and my wife asked ourselves when planning our own wedding. We were married November 1st, 2008 and planned and paid for everything ourselves (with some help from mom and dad of course). We were VERY cost conscious, and had to ask ourselves many of the same questions that you may be asking yourself. At the time, we had great difficulty finding the answers to these questions. I spent countless hours on the internet reviewing videographers and photographers, comparing pricing, reading reviews, trying to resolve in our minds what we should do. It wasn’t until after our wedding was over that I finally was able to answer these questions. Most of the time cost can over ride any desires we may have on our wedding day. B: Of the two, what would be more important to us years from now, a video or photos? Sandhill Studio Philosophy: I may have a bias opinion since I love video as a medium so much, but video can tell a story in a completely different way than photography can. Recently my family discovered a treasure trove of old 8mm silent film from the epic trek both sets of grandparents made from New Mexico and Connecticut to Alaska starting in 1946. The film was inspiring and invaluable in telling the story of our families journey to The Last Frontier. Being a videographer myself, this was probably the most difficult question for me to answer when planning our wedding. Unable to shoot the wedding myself (trust me I would have but my wife would have killed me!) I found it very difficult to find a videographer who could live up to my standards. Sandhill Studio Philosophy: Do your research it will pay off in the end. Compare pricing, compare everything they include in their packages, request samples if they have none on their website, read reviews if you can find any. Have you ever had to sit through HOURS of someone’s family vacation videos? Ever wish they could show you the condensed version of just the exciting parts? Sandhill Studios does just that! With each wedding package we edit a 10 minute Highlight Video that tells your story in a compelling and creative way using the most exciting shots. Even total strangers will rave at how wonderful your day was! The best part is we upload your Highlight Video to YouTube in High Definition. You’ll be able to email or share your wedding on your Blog or favorite Social Networking Site. 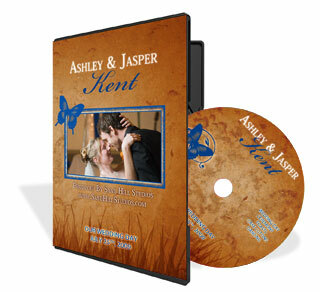 With each wedding package you’ll receive 3 DVDs that will include the same 10 minute highlight video that was uploaded to YouTube, as well as all of the major events of your wedding in their entirety in the extended scenes section of the DVD. From the packaging to the motion menu (example below) our DVDs will be unforgettable! • Final 10 minute highlight video uploaded to YouTube to embed in personal blogs, social networking sites etc. Some videographers charge by the hour. I only charge by the event. I don’t like to be limited by time, I want to make sure that I capture every moment you choose for me to film. Not every wedding is the same. If one of our packages doesn’t meet your needs, don’t hesitate to contact us. We’ll work with you to come up with a custom package that will meet your budget and needs.